I'm wrapping up a unit with my geography class about agriculture. I find it very interesting, as it has direct implications on the lives of every human on the planet. However, I don't think I managed to get my students as interested as I am while we were going through the material. And in a way, I can understand it. There's a lot of geography-specific vocabulary and concepts, and the real meaning can get lost in the small details and the specific meaning behind the symbols. Geography can be dry (and it was when I took it in high school), so I wanted to find a way to make it more real for my students. 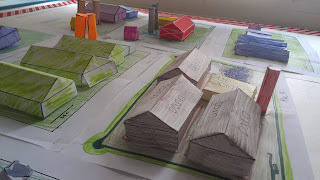 I was in the halls, chatting with some students, and a couple of them asked if we could do a project where they could make a model of a farm. I thought to myself "why not?" and designed the assignment. Since part of the QEP competencies for Geography require students to relate geographic scales and to deconstruct the landscape and understand its organization. So I created this assignment. I gave students a sheet of 11" by 17" paper, with a scale already drawn (5 cm = 20 km). We went over how to scale things properly, and determined the appropriate measurements for each of the required buildings. The students then created a layout with the appropriate buildings organized on the landscape. Now here comes the nerdy stuff! I used Inkscape to create scaled drawings that are nets of the different types of buildings. Students cut them out, assembled them, and attached them to their layout. This reinforced the necessity of using proper scale (since the buildings wouldn't fit on an improperly scaled diagram), and gave students a tangible experience of what the territory would look like. They also seemed to enjoy it a lot! I will definitely use this again in the future. I'll have to fix the silo net (since the rectangle just isn't long enough as it currently stands), and add another size to account for the house that's necessary on some farms. Overall, I'm happy with the way this turned out, and I'm even happier that the spark for this project came from the students themselves. There has been a very positive reaction to the project, and many students have thanked the two who came up with the idea in the first place. So why was this successful? I think this lesson was a success, but not because it's the best idea ever. It was entertaining to do, and I enjoyed it, but I believe the reason for its success was because the students knew it came from them. It wasn't an authentic application - they're not going to be buying farms any time soon, but it was authentic in the sense that I listened to them, and valued their input. My students understand that they have a voice in their own education, and that I listen to it. To me, that is why this was a success.